The road rally portion of the SunDay Challenge started just before the rain arrived. 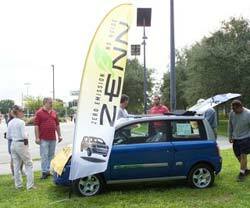 In October, the Florida Solar Energy Center (FSEC) hosted a road rally and exhibition of alternatively fueled vehicles called the SunDay Challenge. Since 1991, the Challenge has helped educate the public about alternative-fueled vehicles by promoting alternative energy technologies that will power the vehicles of the future and help solve our transportation, energy and air quality problems. 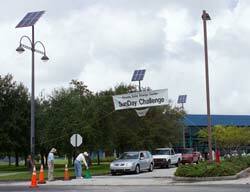 Coinciding with the American Solar Energy Society’s National Solar Tour, the largest tour of sustainable energy features for buildings in the U.S., the three-day Challenge was sponsored by FSEC, the Florida Electric Auto Association, the Florida Institute of Technology (FIT), and the Space Coast Clean Cities Coalition. Dozens of vehicles, powered by electricity, solar, ethanol, biomass, bio-diesel, hydrogen, natural gas, and other renewable energy sources, were displayed throughout the weekend at FSEC. Though some vehicles were prototypes of future car technologies and still being tested, many commercially available vehicles were also on display. One highlight of the display was FSEC’s own “Stealth Truck,” a plug-in electric hybrid funded by the Defense Advanced Research Projects Agency (DARPA). This vehicle is the first of its kind to use LED bulbs for turn signals and brake lights, reducing its heat signature and theoretically making it less vulnerable to weapons attack in hostile environments. There were a number of activities for attendees to participate in. 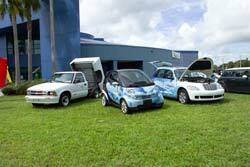 The Plantation High School Electric Car Club let guests ride in their solar car, which was designed and built by the students. The “Green Team,” Brevard Community College’s Environmental Club, cooked hotdogs in a solar oven for lunch. Spectators toured FSEC’s visitor’s center and facility as part of the National Solar Tour, browsed displays, and watched the Autocross event. During the Autocross, car-owners navigated a course one at a time to demonstrate the speed and agility of their alternative fuel vehicles. The road rally, and main event, took place on the second day of the Challenge in the rain. While the weather wasn’t very inviting to spectators, it provided an excellent opportunity to demonstrate the durability of alternative-fueled vehicles. 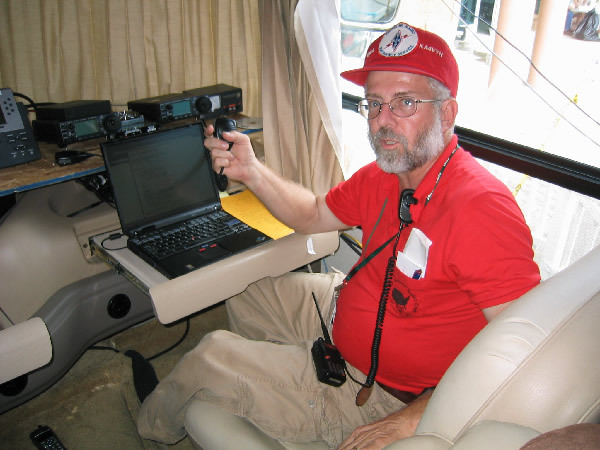 The rally course took participants on a scenic river drive with multiple checkpoints to a finish line located 30 miles south of the center at FIT in Melbourne. On the third and final day of the event, an alternative-fueled vehicle workshop was held in the FSEC auditorium. Speakers at the workshop, “The Alternatively Fueled Vehicle – Advancing the Choice,” included Dr. Sankar Das Gupta, CEO of Electrovaya, a portable power systems provider, and Charles Whalen, public relations director for the Florida Electric Auto Association. Gupta discussed automotive battery technology, while Whalen addressed the need for quick development of infrastructure to support electric vehicle charging stations. Next year’s event is currently scheduled for February 1, 2009. For more information about the 2007 event and next year’s, please visit www.sundaychallenge.org.